During the VA state championships, O’Hara was on fire. All four groups were centered for 50s, with three groups under 3″ and the fourth a 3.715″. That’s consistency. On 1000-yard benchrest targets, the 10-ring is just seven inches in diameter, while the X-Ring is a mere 3 inches in diameter. At the Virginia 1K Championships, James managed to keep all his shots within the seven-inch 10 Ring with eight of the shots inside the 3 inch X-Ring. That is amazing accuracy and consistency. David Goodridge says: “This is truly a remarkable example of superb marksmanship, rifle design, assembly, load development and equipment maintenance.” (O’Hara had previously set a 10-match Aggregate Light Gun World record of 4.5389″ in 2012). James generously agreed to share his knowledge and experiences on the many facets of IBS 1000-yard benchrest preparation, reloading and shooting techniques in an intereview with Australian David Goodridge. This feature originally appeared in Australian Target Rifle Magazine. A few of O’Hara’s responses have been updated, based on a conversation with James on April 8, 2014. Goodridge: James on behalf of the Australian LRBR community I would like to congratulate you on your achievements in 1000-yard Benchrest and thank you for [doing this] interview. To begin, could you provide an outline on your background and the reasons or factors that led you to becoming involved in 1000-yard BR at the Virginia Club. O’Hara: I started short-range Benchrest in 1996 for a brief time and won my first 100-yard IBS match and I was hooked. Loss of eye-sight in one eye put a damper on it and I quit shooting for while, and I started shooting trap to try to switch over to left-handed. It worked and I started to pick up a gun left-handed so I went back to the rifle and built a tube gun. I tried the local groundhog matches but the rules changed every match. I then found the Reade Range and 1000-yard matches. I restocked my gun with a long-range stock and started 1000-yard Benchrest. 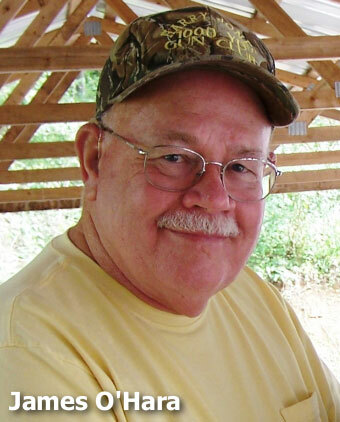 Finding I enjoyed the challenges associated with long range benchrest, I began 1000-yard Benchrest competition at Harry Jones Range and White Horse Range, two IBS ranges in West Virginia. I basically started after the year was under way in 2011 and I must say it was a very humbling experience. I soon learned that my previous short range [techniques] were not working. New scales, a K&M arbor press with a force indicator, led to improvements. Then designing and obtaining reamers to my own specifications led to further substantial improvements, with the end result being that the same loads now seem to work from barrel to barrel. 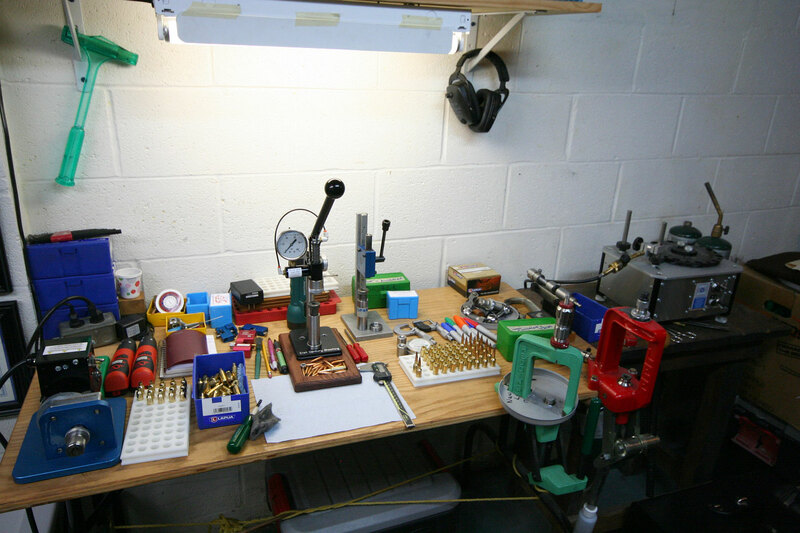 Gunsmithing: I do all the work myself, except barrel chambering/fitting is done by Dave Bruno. Favored Caliber: I use a 6mm Dasher with a .266 neck and a .135 free bore. My load is a 103gr Spencer bullet trimmed and pointed with Hoover tools. Load is Alliant Reloder 15, 33.0+ grains weighed on a GD503 scale, with a CCI 450 primer. Right now I’m jumping the bullet about .006″. Previously, I shot them about .010” into the rifling but it was pulling the bullets or pushing them back. Actions: For the IBS record groups I used a Bat 1.350” Bat B action in a Roy Hunter Stock. Other actions in use include a 1.530” Bat B and a Kelby F-Class Panda. Barrels: The record barrel was a Brux Heavy Varmint, 1:7.83″ twist, finished at 28″, and fitted with a Harrell’s brake. Stocks: I have two Roy hunter stocks and a PR&T and all track very well. They are balanced at two inches ahead of the receiver. All three stocks are glued with liquid Devcon and are pillared, so they are “glued and screwed”. I think this is the best system. Scopes: The PR&T-stocked rifle has a March 10-60X and the two Hunter-stocked guns have Nightforce 12-42x56mm NXS scopes. Rests: My front rest is a Sinclair Competition model that I modified with a cartridge holder that holds cartridges up by the port. I use the new super slick bag by Protektor and a rear Doctor Bag with leather ears. Scope Mounts: Rings are Burris Signature Extra High (the ones with inserts). I turn necks to .0102″ with a K&M tool. Some competitors don’t turn necks, but without uniform neck tension you will have vertical. I use a K&M VLD chamfering tool and a Wilson case trimmer for new cases and when I trim fired cases. I use a nylon brush for inside the necks and clean the cases outside with 0000 steel wool using a small power station or a drill to spin them. The cases are sized on a Forster Coax press with a Harrell’s full length bushing die. Priming is done by hand using a K&M priming tool. I throw a “close” charge with Harrell’s bench rest powder measure. 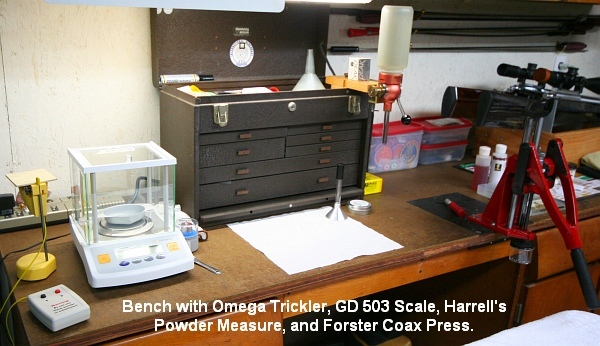 That charge goes in the pan of my Sartorius GD503 scale and then I trickle up to weight with an Omega powder trickler. 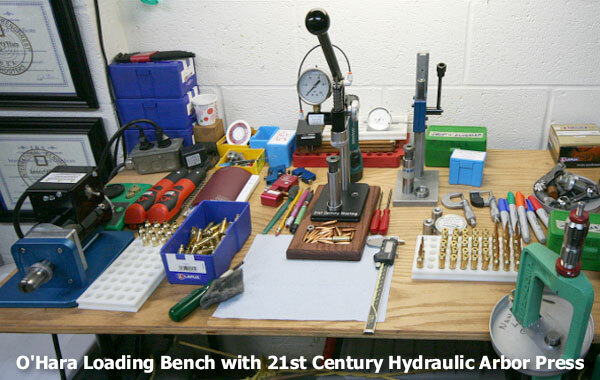 For bullet seating, I now use the 21st Century Hydraulic arbor press with seating force indiciation. I previously used the K&M arbor press with force indicator — it was good, but the 21st Century unit is more sophisticated, more precise, and easier to read. I have a loading block that is color-coded in the pounds of force needed to seat the bullet. I try to keep rounds in sets of 3-lb seating force settings. Each loaded round is put in the appropriate column (based on measured seating force). All loaded rounds are color-coded to avoid mixing. Leftovers from matches are used at a later date. I have now made a tool from an old bearing surface comparator. It will contact the ogive of the loaded round and it will check the seating depth while it is sitting on a granite block. Relying completely on the force and feel of the dial indicator allows seating depths to be held to .0005″ (i.e. one-half-thousandth). Compared to others means, this seems a more accurate way to check seating depth. Bullets are spun on a Juenke machine after they are trimmed on a Hoover trimmer and pointed on the Hoover tool. For the next step, a Tubb Bearing Surface Comparator is used to sort bullets to plus/minus .0005″. I don’t discard any bullets — if I have some small lots of bullets that have a shorter or longer measurement they are used for testing. With the Spencer and BIB bullets there are not many that are not within plus/minus .001”. I quit weighing cases because of the outside variations. I only do what makes a difference [on target] and I only test and do load development at 100 yards, where I can control the conditions. For the 2013 season, I cut barrels back to 28″ and had them “frozen” (cryo-treated) at Cryo Plus. I think that both barrels are average in the wind, but the first shot from a clean barrel is in the group. I shot around seven 100s with my other Light Gun. In Heavy Gun, I even won the group Aggregate at the Virginia State shoot. I have cryo-treated all of my barrels and I believe I have proof that it does produce benefits. I talked to George Kelbly about this before I did it. My results agreed with what George had indicated: fire cracking was less, chambering was easier and the major benefit was that the groups did not ‘walk’ as the barrels became heated. I use a spotting scope to help see the flags and the mirage. The mount is a Sinclair for the bench. This really helps because I can’t see the flags far out. I think the most important part of the set up is getting the gun to track, it has to come back in the box every time and shooting under the same condition every shot. I know everybody likes to run them — I do if the condition holds — but if it doesn’t you must pick them one at a time. This is where the direction and the speed of the wind come into play; you must shoot in the same condition you zero in. When I set up to shoot, I line up the gun on my target and I move it back and forth till I can get it coming back in the ten ring and then I set my scope. I load my record rounds in my holder and I use my sighters out of the box. I now am watching and timing the conditions and I now make the decision of the one I will use and this is the only one I sight-in with. If I have some big guns beside me with brakes, I will wait till they are done or try to get in between their shots (this doesn’t always work). Trigger control is a must and you have to be consistent. I will give up a perfect sight picture for a perfect trigger pull. I use free recoil and only my finger is on the trigger. After the rifle recoils back, I hold the fore-arm and open the bolt — you have to be careful not to upset the gun in the bags. After loading the next round, I close the bolt and push the gun forward with my right hand on the fore-arm. I am guiding [the stock] forward in between the bags. This gives me less chance to make a mistake, and maybe half of the shots need no or very little adjustment. I know it’s hard to get accustomed to, but try not to take your eye out of the scope so you are watching the mirage and not to get caught in a change. For the best part, I shoot free recoil and do all my testing at 100 yards in my backyard range. I zero dead on at 100 and come up 24 minutes for 1000 yards. I never try to get the gun super clean at a match, I like to see a little gray on a clean patch. I don’t want the barrel to be squeaky clean — I like to see a little haze on a patch. When it’s like that, after one fouling shot, the next shot usually goes right where it’s supposed to. When it’s squeaky clean, it may take five shots to foul in. I used a product called WartHog 1134, and it has served me well for a long time but now that the Hazmat stopped the shipment of it, so I went to over-the-counter products and all are equally bad compared to what I had used but they do the job, it just takes longer. I never pull a patch or brush back through (across the crown), I go one way only (outward) out and then unscrew the brush or take the patch off at the muzzle. I use a 50/50 mix of Hoppies and Kroil after I clean. Just before I shoot I run a smaller patch down the bore to leave a very thing film of oil in the bore. I never want to shoot over a dry bore. If you shoot over a squeaky clean, dry bore, you’ll get copper every time. Goodridge: James, on behalf of all Australian IBS 1000-yard BR competitors, I would like to thank you for your great patience and cooperation in preparation of this article, and for the valuable and interesting insight that you have provided into what is required to achieve success at the highest levels of 1000-yard BR competition. Not that you need it, but good luck for the 2014 shooting season.